Gross Domestic Income (GDI) is the lesser-known cousin of Gross Domestic Product (GDP). Both figures measure the value of all production in a year, so their final totals are virtually identical. However, they differ in how they arrive at that final total. While GDP measures what gets purchased, GDI measures who gets paid. GDI, therefore, is a very useful measure for determining how Americans earn their incomes and maintain their standards of living. Using this data series has some distinct advantages. Unlike almost any other income data, it is complete; it adds up to the total value of all economic production. Additionally, the Bureau of Economic Analysis (BEA) has put together data on American GDI going back to the start of the Great Depression, making it a very long-running data series. – About half of all income is labor compensation, in the form of wages, salaries and benefits. – Benefits account for a growing share of labor compensation. – A quarter of income goes to business-level taxes and the replacement of worn out machinery. – A quarter of income is returned to owners of capital, including business owners and private homeowners. – The shares of income returned to workers and to owners of capital remain constant over time once benefits, taxes and depreciation are properly accounted for. Two-thirds of net income goes to labor and one-third goes to capital. Study of inequality should focus on the distribution of income within labor compensation, rather than the distribution of labor and capital. Labor and capital are complements, not opposing interests. 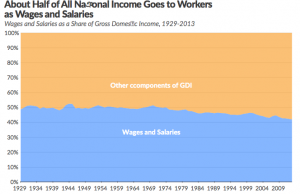 A comprehensive look at the history of income in the U.S. is a worthwhile endeavor in itself. However, it has important implications for policy debates as well.